Do you have questions about the use of credit checks when recruiting? From getting paid on time to guaranteeing that a candidate has no financial skeletons in the closet, there are some aspects of the recruitment process that a recruiter can’t entirely control. Are adverse financial checks really the answer to tackling these potential hazards though? Before we go on, I feel that it’s fair to offer you a guilt-free, no-questions-asked opportunity to leave the page before things get a little, well, heavy. What a credit check is and how it relates to recruitment. Why agencies (and employers) should credit check a candidate. Jobs that require a credit check. The importance of credit checking clients. How can an agency deal with a client who has a poor financial history. Why do recruitment agencies do credit checks? In layperson’s terms, a credit check involves pulling a report about the financial history of a person or company. Credit reports (or credit files) cover a six year overview of loans, credit cards, mortgages and any other type of borrowing. They are typically used by lenders to see how financially responsible or healthy you are, thus helping them make decisions on your credit application. But what does credit checking have to do with recruitment agencies? Okay, as well as giving lenders confidence, the impact of credit reports can reach to the world of employment. 2. To vet potential clients. Simply, protection. Whether it’s making sure that a candidate is financially healthy or ensuring that your recruitment agency gets paid, credit checks give agencies (and employers) peace of mind. What is a recruiter looking for in a credit report? Agencies are looking for signs of financial mismanagement. This may include evidence of County Court Judgements (CCJs), bankruptcy or any other adverse financial situation. They will then use this information to make an informed decision on a candidate, or even a potential client. What about the legality of credit checks? In the world of recruitment, the terms ‘credit check’ and ‘credit report’ are used interchangeably – something we’ll discuss later. Credit scores are not available to view, however employers and recruitment agencies are free to pull a credit report PROVIDING THEY HAVE PERMISSION FROM THE HOLDER. Consent will usually be attained during the recruitment process, however a candidate can decline this. As for a company background check, businesses are welcome to seek out information that’s already in the public domain, such as data that’s submitted to Companies House. All checks should comply with Financial Conduct Authority (FCA) standards. Depending on the job role or company, it’s not that uncommon for candidates to be subjected to a credit check. While this might sound a little underhand, financial checks have become increasingly popular in many professions. When a recruiter or employer pulls a candidate’s credit report, this is usually as part of a wider pre-employment screening process, and, amongst many other things, will involve looking at a candidate’s financial history. Credit history.Criminal record.Personal information (DVLA, FCA, social media, etc).Identify fraud. Okay, so we know why they’re used, but which credit checking service should you choose? Is an employee credit check relevant for all roles? 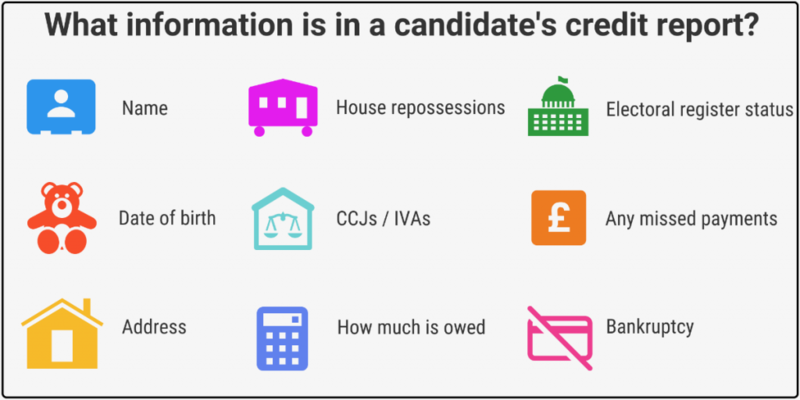 Although pre-employment screening will be used for a whole range of vacancies, credit checks are mostly implemented when the role entails the management of money. Jobs in banking, accounting or management are therefore particularly prone to checks. When hiring for finance-related jobs, employers may be interested in how candidates handle money in their personal lives. Obviously, a person’s home life isn’t necessarily a reflection of their professional capabilities, but peace of mind is much sought after when making any new hire. What if it isn’t a finance-related job? Companies typically have a lot of sensitive data – data that employees will probably have access to. Although a credit report can’t tell you whether someone is trustworthy or not (something that we can’t highlight enough), employers will certainly be interested in anything that might suggest an element of doubt over a candidate’s character. Will a credit check affect a candidate’s credit score? It’s important to state that an employee credit check WILL NOT have any effect on a candidate’s credit score. Although it falls under the umbrella of a ‘credit check,’ it actually differs to what a lender would perform and doesn’t carry the usual implications. When submitting this type of report, credit companies are actually offering a different product from a standard credit check. Only the individual will be able to see that you’ve carried out this check and won’t be considered a factor when scores are calculated. What is the value of candidate credit screening? The main interest in a candidate’s credit score stems from a need to find ‘responsible’ staff for a client. An agency’s reputation is built on finding the very best candidates and pre-employment screening is intended to add another hoop for job seekers to jump through. Basically, a poor financial background could imply a ‘devil may care’ recklessness. Presenting a candidate who may have a history of bankruptcy, if discovered by the employer, may not reflect well on the agency – especially if the employer then has to incur the cost of a bad hire. Of course, there’s absolutely no evidence that being good with money automatically makes someone a better job applicant than someone with a hole in their wallet, but you get the point. As a recruiter or employer, therefore, the question you have to ask yourself is: ‘would I turn away the perfect candidate, if they had a bad credit report?’. 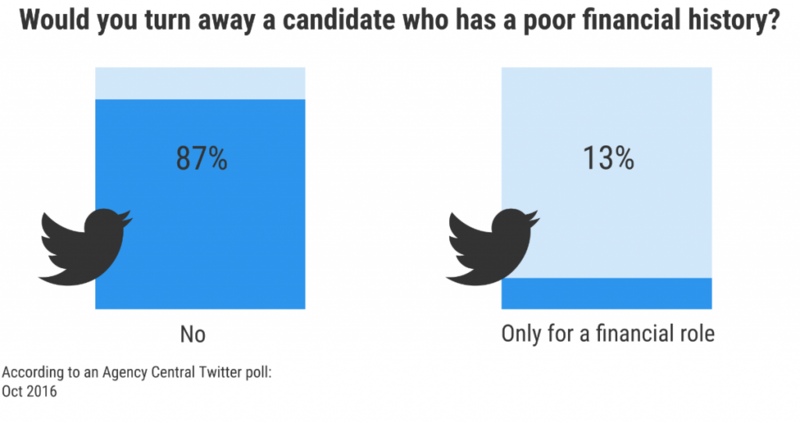 According to our poll, it appears that the majority of recruiters and employers are able to look past a candidate’s financial situation. While it might be important to carry out candidate credit checks on behalf of your clients, what about the clients themselves? Employers aren’t the only ones that need protection and recruitment agencies may be wise to do a little digging (legally of course) on the businesses that approach them. In early 2016, it was found that SMEs were owed £255 billion in late payments. The report by Zurich, showed that 53% of surveyed SMEs were waiting for overdue money, with two in five expressing that late payments are having a significant impact on cashflow. Therefore, with 85% of UK employment firms having fewer than 10 employees, can the recruitment sector afford to take on clients with a poor financial history? Well, the best way to look at the financial record of prospective clients is to sign up to one of the three main credit reference agencies in the UK. These are Experian Equifax and Call Credit. Signing up to any of these services comes with a fee, but will give recruiters access to information such as a client’s credit limit and level of risk. Information is taken from lenders and public records, and though it can’t guarantee that a company will pay-up, it’ll show whether they’re capable of doing so. Of course, if you don’t want to go via an agency, you can always ask the company for a bank reference or go and visit them in person. Just because a client has a bad financial record, doesn’t mean that you have to avoid working with them altogether. Of course, any decision to engage with such a client is completely at the risk of the agency, but there are methods that could offer some protection to your business. It might seem obvious, but demanding payment upfront may be the best option for dealing with a client who has a bad credit history. While not all employers will be so enamored with the idea of paying for a service in advance, the danger of having the service withdrawn completely may leave them with little option. Alternatively (but along the same lines) you could request a percentage of the fee upfront. Though this won’t guarantee full payment, ensuring that you receive some of the cost will at least provide some protection to your agency. If cashflow is a problem, recruiters could choose to approach a factoring firm to chase the debt. Factoring is a type of finance whereby a business (a recruitment agency in this case) will sell invoices to a third party for a discounted price. The third party will then chase the full invoice fee from the client (employer). This ensures that the agency receives money and that the factoring company makes a profit. Can avoid ongoing disputes with clients. Lose some control of the payment process. Clients may prefer to deal with you directly, thus damaging relationships. Should you take the risk on a client with a poor credit history? It may sound abrupt, but sometimes, you might just have to bite the bullet if a client has a poor credit history. There are no guarantees in recruitment, be that finding the ideal candidate or getting paid for finding that candidate. Depending on the job being filled and the potential financial reward on offer, it may actually make more sense to take the risk rather than go through the expense and rigmarole of doing a background check. Sure, more lucrative requirements may justify a little digging, but you could probably take the chance on a menial temp job. What should you take away from this article? Credit checking, while incapable of painting a full picture of a client or candidate, can help agencies make informed decisions about who to work with. It’s important to note though, that financial information should form only part of the decision making process and not be the be all and end all. Just because a candidate has some outstanding debts doesn’t make them a bad candidate, and just because a client is considered ‘risky’ doesn’t mean that you should turn them away. Everything should be done on a case by case basis. So whether you’re a new consultant improving your skills or a long established agency, background checks are worthwhile, but remember that there’s more to a person or company than just the bottom line. The truth about AI recruitment: how safe are our jobs?